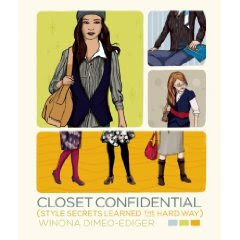 When I first started reading Closet Confidential I was a little skeptical about the content, because there are about a million books about fashion and closets, and it's always the same information recycled over and over again. What usually makes one book stand out from the crowd is the narrator's voice, and fortunately, Ms. Winona here has a great and funny one! If you don't know anything about fashion, mixing and matching separates, different body shapes and the clothes that flatter each of them, or the difference between an Oxford and a Polo collar, this book is definitely for you! It's a 101 guide that will teach you how to find your perfect pair of jeans, how to layer tops, when it's ok to wear a T-Shirt, when it's not ok to wear a T-Shirt, how to pick a bra, how to pick a coat... you get the point. And as I said before, all this advice is not written in the common and sterile "guide-format", but every tip usually comes with a story and every story has the author either having to wear a garbage bag, or choosing to wear a pink and a purple sneaker, or casually displaying bracelets that gave out, unknowingly to her, unusual sexual messages... because as the subtitles specifies, most of these style lessons were learned the hard way. I certainly don't agree with everything she writes - I am, after all, a fashion expert as well ;) - for example, she hates sneakers worn outside an exercise environment, while I sometimes wear sneakers to pretty much everything 'except' to exercise! And she hates "lounging around the house robes" because she feels nothing gets accomplished while wearing one, while I love them for exactly the same reason: "sorry honey, I couldn't iron your shirts, I had my robe on, you know?" But I do agree with a lot of what she writes, especially when it comes to handbags: "... a purse is so much more than a black hole in which to lose your keys... is laden with deep emotional and personal implications... to take a peek inside a woman's purse is to see an intimate snapshot of her world..." Words well written! But the most important point to me was what kind of, if any, style lessons was I going to walk away with, and to my surprise the answer was "many"! 1) I should go to bed feeling beautiful. It's hard for me to love shoes other than high heels (and sneakers), but they are pretty much always uncomfortable for me. The thing is I always thought that the problem were my feet, not the shoes: I thought I had pansy feet that couldn't handle the high demands of fashion. Reading about someone else's opinion, and how she firmly believes that anybody that says that 4 inches heels are comfortable is lying, felt good. It made me reconsider the madness that are high heels, and I've promised myself to start paying more attention to 2 inches heels (and below). 3) I need to accessorize more. Her love for stacking up necklaces, big and small, her creativity in using belts and her philosophy behind sunglasses is so contagious, and it has made me realize that I do not accessorize enough! And you can be sure I will fix that with a few weeks of focused shopping! This was a fun book to read, and since I've had my baby, probably one of the few I've been able to finish! So if you like fashion and you need help with the contents of your closet, and if you are looking for a simple to follow how-to guide, this book is definitely for you. You know, I'll check out the book in the library, but I am not sure it could teach me anything different either. I like my style the way it is, and I know what works and what doesn't. P.S. I just started, so I'd love it if you'd come by and check me out!